Perhaps one of the most rewarding experience is making a freshly baked bread. 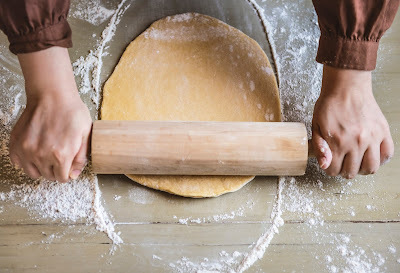 The feeling of making the dough, the smell of the bread right after it’s baked, and the satisfaction you feel when you break the bread if it is properly baked is very fulfilling. For this reason, it is easy to say that baking fresh bread is one of those things that can easily make us feel home and relaxed. And you can do it on any occasion, just for you or for your family. All you need are a few recipes and you can now have your own bread. Here are five delicious bread recipes you can easily make. This is one of the simplest bread recipes to make out there because it just involves two ingredients: flour and water. When making a good sourdough bread, it is important that you make a good starter. It is simply a mixture of water and flour in order to activate the wild yeasts that are naturally found in flour. You don’t have to buy a commercially-made yeast. This process also means the bread can last longer as it prevents the loaf from going stale fast. For a dense and nutty loaf that is packed with coconuts, oats, nuts, and fruits, Muesli loaf is the perfect bread for you. This bread recipe makes a good breakfast staple. Muesli bread recipe requires a lot of ingredients but the end product is worth it. You are going to need some whole milk, honey, dried active yeast, spelt flour, some oats, nuts, desiccated coconuts, dried apricots, and more. If you want to bake a good bread for less than an hour, one of the simplest one to make is soda bread. This is very ideal when you are in a hurry as it only requires you to use 4 ingredients. It is basically just a mix of plain flour, a mix of wholemeal flour, bicarbonate of soda, and buttermilk. Once you have properly mixed the dough, just knead them briefly to form into a ball. You can make them for 30-40 minutes and you now have your soda bread. If you want to a more savory bread for a dinner party with your friends and family, making a garlic and cheese swirl buns would be the perfect recipe to follow. You will need some whole milk, dried active yeast, plain flour, egg, unsalted butter, and mozzarella cheese. For the garlic butter, you are going to need some unsalted butter, parmesan cheese, garlic, and flat-leaf parsley. One of the best bread recipes that people will surely love if you host a dinner party is a cheese and garlic pull-apart bread. It is easy to make and is great to be served whether it is warm or cold. You are just going to need some strong white flour, sprouted spelt flour, salt, active dry yeast, cold-pressed rapeseed oil, emmental cheese, and garlic. This is really nice post very nice information I will definitely try this.